Lactarius azonites has no generally-accepted common name and looks rather like a pale form of the Sooty Milkcap Lactarius fuliginosus; however, it is immediately distinguished when the stem flesh is cut, because it reddens rapidly. 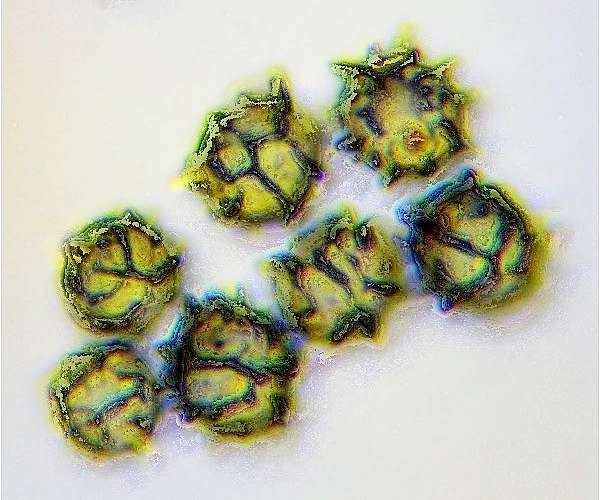 When the spores are examined under a high-powered microscope, the reticulate ornamentation is seen to be extremely pronounced. 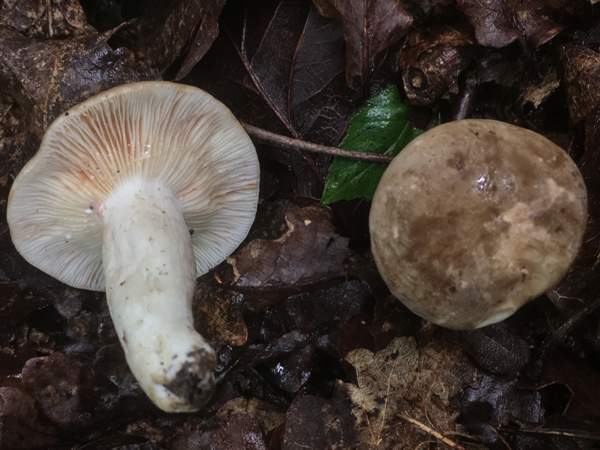 Only an occasional find but nevertheless quite widespread in southern England, this milkcap is a much rarer find in Wales, northern England and Scotland. 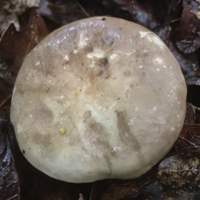 Lactarius azonites is recorded in many parts of mainland Europe including Germany, Holland, France and Italy; this milkcap is also reported to occur in some parts of Russia. 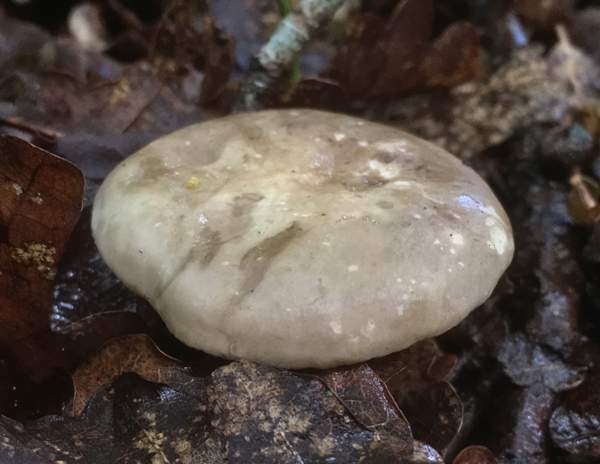 This rather drab milkcap was first described scientifically in 1791 by French botanist/mycologist Jean Baptiste Francois (Pierre) Bulliard, who gave it the Agaricus azonites. Initially Elias Magnus Fries gave it the name Lactarius argematus, but in his Epicrisis Systematis Mycologici, completed in 1838, he renamed it, establishing the currently-accepted scientific name Lactarius azonites. 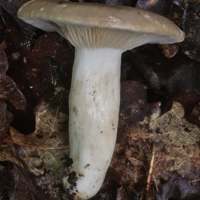 Synonyms of Lactarius azonites include Agaricus azonites Bull., Lactarius argematus (Fr.) Fr., and Lactariella azonites (Bull.) J. Schröt. 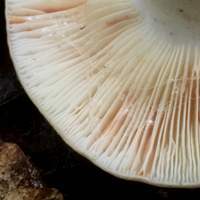 In the past this milkcap was also considered by some authorities to be just a pale-stemmed variety of Lactarius fuliginosus, the Sooty Milkcap. The generic name Lactarius means producing milk (lactating) - a reference to the milky latex that is exuded from the gills of milkcap fungi when they are cut or torn. 4 to 9cm in diameter, low convex to plane, eventually developing a slightly depressed centre; cap surface is smooth or more often very finely velvety, the margin usually being slightly irregular. The cap colour is variable, ranging from pale ochraceous or olivaceous buff through clay-brown to grey-brown. The moderately-spaced anastomising (forking near the cap margin) cream-ochre to pinkish-buff gills are broadly adnate to shortly decurrent. The abundant latex is white, eventually staining the gills flesh pink; it has a mild taste. 3 to 5cm tall and 1 to 1.5mm diameter, cylindrical or slightly fusiform; smooth; white or pale grey, bruising pink. There is no stem ring. 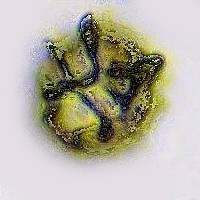 Gobose to broadly ellipsoidal, 7.5-9 x 7-8µm; strongly reticulate - ornamented with warts and ridges (up to 1.5µm tall) forming a partial network. Faint but pleasant fruity dour; a fairly mild or only slightly bitter to acrid taste. Mycorrhizal, usually in deciduous woodland, particularly under oaks. Lactarius fuliginosus usually has a darker cap, a darker stem, and non-forking gills; its spores are ornamented with an almost complete reticulum of warts and ridges up to 1µm tall. Roger Phillips records this species as not edible; however, in Russia, and perhaps elsewhere, these milkcaps are sometimes salted or marinated for winter use. In Britain, they do not occur in quantities that justify collecting them to eat, so I suggest it is wise not to collect them unless required for scientific study. Jacob Heilmann-Clausen, Annemieke Verbeken, & Jan Vesterholt (1998). The Genus Lactarius (Fungi of Northern Europe—Vol. 2) The Danish Mycological Society. Fungi of Switzerland, volume 6: Russulaceae, Kränzlin, F.
BMS List of English Names for Fungi.